Hundreds of thousands of people remain without power as an ice storm sweeps the central US, amid warnings of more freezing weather to come. The storm, which has hit the state of Oklahoma hardest, has been blamed for the deaths of at least 22 people. Further ice storms are forecast for parts of Missouri, Kansas, Iowa, Illinois, Wisconsin and Indiana. Ice up to 1in (2.5cm) thick coated parts of Oklahoma and Missouri on Monday, where states of emergency have been declared. 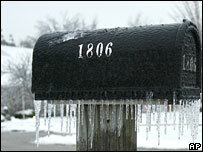 About an inch of ice was expected over parts of Iowa on Tuesday, followed by up to 5in (12.7cm) of sleet and snow. "The predictions were pretty grim and they're still not good at all," said meteorologist Noelle Runyan. The worst-hit states so far have been Oklahoma and Missouri, where at least 18 people have died, mostly on roads made treacherous by driving sleet and ice. A homeless man died of hypothermia in Oklahoma City. Another four people are reported to have died in Kansas. Kathy Nash, a 30-year-old advertising executive from Oklahoma, told Reuters news agency she and her husband had been without power since Monday. "We don't have any heat. No lights. Nothing. We have nothing at all," she said. The couple had been making do with torches, candles and layers of warm clothes, she added. The storm has shut down many schools, businesses, roads and airports. Grounded flights have even affected the campaign plans of several presidential candidates. Former President Bill Clinton was forced to postpone events for his wife, Democratic frontrunner Hillary Clinton, in eastern Iowa. Michelle Obama, wife of rival Democratic candidate Barack Obama, also had to abandon plans to campaign in the state on Tuesday. Meanwhile Mike Huckabee, the Republican former governor of Arkansas currently enjoying a surge in the polls, cancelled stops in western Iowa. More than 100,000 people in Missouri also lost power, with some 90,000 in Kansas and more than 17,000 in Iowa suffering blackouts. Utility companies have warned that it could take a week to 10 days to restore power to all homes, as icy weather hampers repair efforts. Emergency generators have been shipped into some of the worst-affected states to power nursing homes and sewage works.